China’s Revaluation: Baby Step or Great Leap? China’s modest revaluation of slightly more than 2% in the value of the yuan against the dollar was either a baby step or a giant leap forward, analysts say. The adjustment in the pegged value of the yuan to 8.11 from 8.28 to the dollar was accompanied by a move to a managed float against a basket of currencies, but many details of the central bank’s new policy went undisclosed. While a 2% revaluation of China’s currency isn’t going to eliminate the US trade deficit, analysts say, the possibility of a regime change in the country’s foreign exchange policy could introduce the flexibility and additional appreciation of the yuan that will add up to something very significant in the long run. The People’s Bank of China has not published, and will not publish, the components of the currency basket, but analysts surmise it will include the currencies of countries with which China does most of its trade. 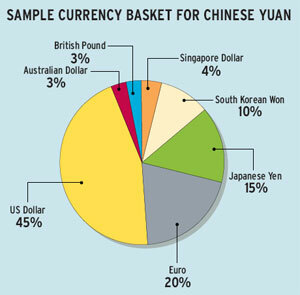 “Our best guess is that the currency basket may give the US dollar the highest weighting of 45%, as it includes the trade weights of both the US and Hong Kong and reflects the intention of the authorities to initially maintain relative stability of the yuan against the dollar,” says Michael Spencer, chief economist for Deutsche Bank in Asia, who is based in Hong Kong. “This is deemed necessary to control speculation and to ease domestic opposition to currency reform, especially during a transition period when foreign exchange hedging products are not readily available for most importers and exporters,” Spencer says. The formation of a currency basket should have no immediate impact on the currency composition of China’s foreign exchange reserves, Spencer says. But to the extent that the Chinese currency’s flexibility has triggered a new downtrend in the dollar, this could affect China’s assessment of the profitability of holding dollar reserves and weaken the argument for holding dollar assets, he says. Deutsche Bank forecasts a 5% appreciation of the yuan in the next 12 months, on top of the initial 2% move. The governor of the People’s Bank of China, Zhou Xiaochuan, said the 2.1% revaluation of the yuan to 8.11 to the dollar on July 21 was an initial step and that the central bank would adopt a gradual approach to reform the country’s foreign exchange system. “China’s overall buying power has increased, the currency is stronger and has more value,” he said on state television two days after the change was announced. “The positive effects on the economy will be much greater than the negative effects,” he said. China’s export companies should probably increase their prices, which would help to correct imbalances in global trade in an orderly way, he suggested, although this was not likely to have a major impact on the US trade deficit. 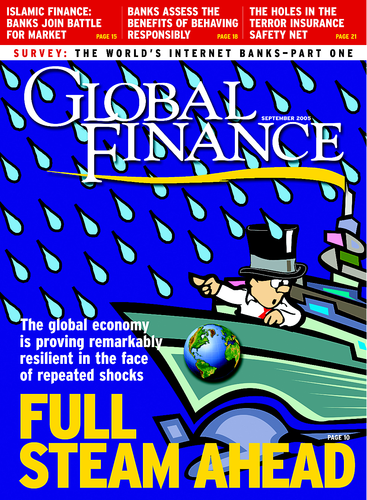 Globalization and the integration of emerging markets into the global economy have resulted in rapid increases in their share of world trade and their importance in determining the real trade-weighted value of the major currencies, says Bankim Chadha, global head of macro foreign exchange research at Deutsche Bank in New York. The share of emerging markets in US trade has doubled from 25% in the early 1970s to almost 50% now. The real values of emerging market currencies, therefore, now determine almost half the real value of the dollar on a broad, trade-weighted basis, which is the most relevant measure of the exchange rate for gauging prospects for US trade flows and the current account, Chadha says. The extent of the US external imbalance argues for a dollar well below historic averages to affect external adjustment, Chadha says. Thus, even significant appreciation of emerging-market currencies of about 12% against the dollar should be expected to have only a modest impact on the US external balance, he says, since this would only bring these currencies to around their historic averages. Speculators seem to be pouring money into China, keeping the yuan under upward pressure against the dollar, says Carl B. Weinberg, chief economist at High Frequency Economics, based in Valhalla, New York. Weinberg says that the Chinese government is not prepared to say how it will set the exchange rate or how often it will adjust the reference rate or even how it will intervene if market trading moves the currency more than 0.3% away from the pegged level. The reference for the peg can be defined using any of several currencies on a given day, Weinberg says. If the People’s Bank of China does change the peg again, it will try to surprise the market, Weinberg says. “However, even one more revaluation will prompt a flood of speculation about the timing of the third, fourth and fifth adjustments of the peg,” he says. Meanwhile, China’s foreign exchange reserves jumped another $52 billion in the three months to June, to a new record high of $711 billion. While that’s still below Japan’s $843 billion, the gap is narrowing fast, say analysts at Brown Brothers Harriman in New York. If China’s reserve growth continues at this pace, they say, China will be the world’s largest holder of foreign exchange reserves by early 2006. China’s top planning body, the National Development and Reform Commission, said the yuan revaluation will cut exports and employment in the near term and that the government would have to act to counter this negative influence. The State-Owned Assets Supervision Commission said that China’s economic growth could slow for the full year 2005 to 9% from 9.5% in the first half. It added that rising costs are crimping profits for steel makers and other users of imported raw materials. China’s currency move has ramifications for all of the financial markets, says Kathy Lee, chief strategist of Forex Capital Markets, a New York-based online foreign exchange agency trading service aimed at middle-market hedge funds and financial institutions. “As the world’s second-largest holder of US treasury securities, China will have a reduced need to buy treasuries and this could potentially take away a big buyer from the market,” Lee says. “If this is the case, it will cause bond prices to slide and long-term yields to rally, which could offset some of the additional pressure on the Federal Reserve to continue raising rates,” she explains. “If China even begins to dump US treasuries, we could see the yield-curve conundrum [in which long rates have remained stuck while short-term rates have risen] begin to fix itself,” Lee says. The decreased demand for US treasuries and the possibility of increased demand for other currencies such as euros and Japanese yen could be very negative for the dollar, according to Lee. The yen benefited from the revaluation, which made Japanese goods more competitive on a relative basis against Chinese goods, she says. Malaysia followed suit immediately by scrapping its own ringgit peg and also adopting a managed float. While the initial effects of China’s currency change are likely to be modest, it marks the beginning of an exchange-rate adjustment that will likely contribute to containing global imbalances in the long run, says Lewis Alexander, chief global economist at Citigroup. “One of the motivating factors behind the decision was the need to contain persistent macroeconomic imbalances within the Chinese economy,” he says. Very strong investment in China continues to drive growth, Alexander explains, and major bottlenecks in energy and transportation infrastructure are generating inflation pressures. “The desire to divert growing protectionist pressures may have also played a role in China’s decision,” he says. If the impact of the yuan appreciation on China’s exports and on its economy proves to be relatively modest, Chinese officials will likely be encouraged to accelerate the pace of currency appreciation, according to Alexander. “Given the modest prospects for exchange-rate adjustment in the near term, we expect the US current account deficit will continue to widen, rising above 7% of gross domestic product in 2006,” he says. By stating their intention to manage their currency relative to a basket of currencies, Chinese officials are probably signaling their willingness to allow the yuan to appreciate relative to the dollar if other currencies, such as the yen and the euro, are again pushed higher, Alexander says. Meanwhile, in Washington, legislators are growing more restless, says David Gilmore, economist and partner at Essex, Connecticut-based Foreign Exchange Analytics. Sen. Charles E. Schumer, Democrat from New York, and Sen. Lindsey Graham, Republican of North Carolina, the leading trade protectionists in the Senate, said that what China did in July was a good first baby step, but more needs to be done. If not, the severe Schumer-Graham bill to impose 27.5% tariffs on China will go to a floor vote in the Senate in October and very likely win the backing of a majority, in not just the Senate but the House, forcing a presidential veto and possibly an override, Gilmore says. “For China, allowing the yuan to rise another 2% by the fall is a small price to pay for avoiding a costly round of trade sanctions,” Gilmore says.